Fram, which bore the Amundsen expedition to Antarctica. Photo courtesy ArticIce.org's Hall of Arctic Explorers. In the race to be the first to the South Pole, the two contenders were Robert Falcon Scott, of the Royal Navy, and Roald Amundsen of Norway. Scott had Royal sponsorship, but Amundsen had to persuade his backers of the commercial possibilities of his expedition. These were the days before the Panama Canal, and the only shipping routes around the Americas were long and expensive. 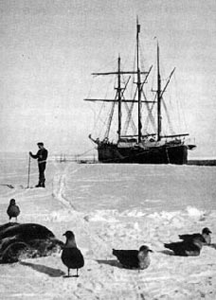 To make the investment in his expedition attractive, Amundsen told his backers that he was exploring the Arctic, which held much more commercial interest than did the Antarctic. Just one thing — he was lying. His true motive was to be the first to reach the South Pole. Amundsen successfully misled everyone. He broke the rules. Breaking the rules is sometimes the best way — sometimes the only way — to get things done. When we break the rules, and then fail, we can end up in deep yogurt. But when we break the rules and then later succeed, people sometimes overlook the transgression. And sometimes they don't. When is rule breaking a useful strategy? What rules can we break safely? Here are some tips for breaking the rules. Older rules tend to be more breakable than newer rules. Sometimes the conditions that led to them no longer apply, and sometimes their chief architects have moved on. Of the older rules, those that are frequently applied tend to be the strongest. The old, dusty ones that lack constituencies tend to be the most breakable. The end doesn't justify the means, but what people care about does matter. If the goal is attractive enough, people tend to look the other way when rules are broken. Break rules only when you're aiming for a goal people care about and you think your chances of achieving it are good. Breaking organizational rules is one thing. Breaking laws is another. Law breaking invites all kinds of consequences, and organizational benefits aren't likely to count for much. Be knowledgeable enough to stay within the law. If you personally gain from your rule breaking, you're asking for trouble. Breaking the rules is much more likely to be acceptable if the organization is the principal beneficiary. Even better if your boss and the applicable rule enforcement unit are beneficiaries. If you fail, and if you broke rules in the attempt, you might have to pay a price. The price can include organizational discipline, termination, or even "blacklisting" in your profession. Be certain that you're prepared to endure the consequences if the organization decides to take action. Would you like to see your comments posted here? rbrenbcyrCerdJIPOyVVhner@ChacEgFUXWLgUpuebifooCanyon.comSend me your comments by email, or by Web form. See also Workplace Politics and Problem Solving and Creativity for more related articles. I offer email and telephone coaching at both corporate and individual rates. Contact Rick for details at rbrenXVcvyvyWjtCeLGfEner@ChacrDNrkZqTmcoALiLwoCanyon.com or (650) 787-6475, or toll-free in the continental US at (866) 378-5470.